Back in May, Spotify announced that it would soon introduce videos and podcasts to its streaming service line-up, though they weren’t exactly willing to provide a proper launch date at that time. Today, their VP of product, Shiva Rajaraman, told the Wall Street Journal that an update for Android would include these new features this week. At least one reddit user is already seeing new the Shows and Podcasts sections, though the rollout for them could happen slowly. I, for one, am not seeing these new sections quite yet, even though Google Play is showing that a new update arrive on Android today. 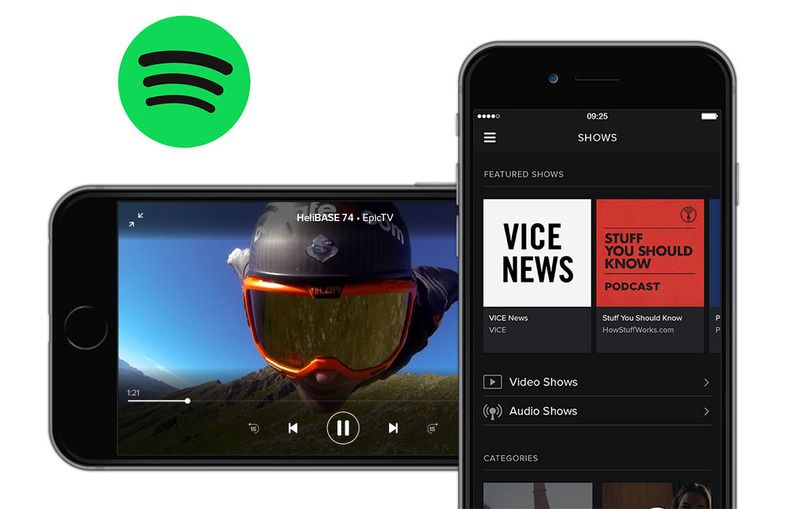 Spotify has teamed up with companies like ESPN, Comedy Central, BBC, and Vice for content. On their newly updated website, they envision a world where you catch up on news video during your commute, get some “giggles” in during lunch, and checkout a story before going off to bed. They also hope that podcasts will be a much welcomed addition to your daily tune line-up. Spotify hasn’t exactly announced timing for the update outside of a mention to the WSJ, so if you aren’t seeing these new sections quite yet, it shouldn’t be much longer. The iOS version with videos and podcasts should be here next week. Tell us, though – were you looking for another video platform outside of YouTube and the variety of other services? Does having a music service that doubles as a video service sound promising to you?